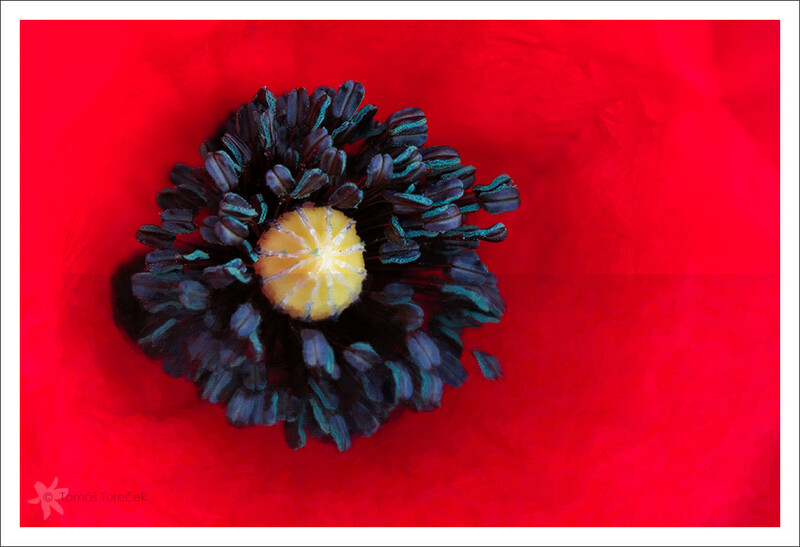 A Common Poppy (Papaver rhoeas) is grown in our country on vast fields. It is on different fields every year so you can’t be ever sure where it will be next time but it is for sure that it WILL be on some fields in our village. 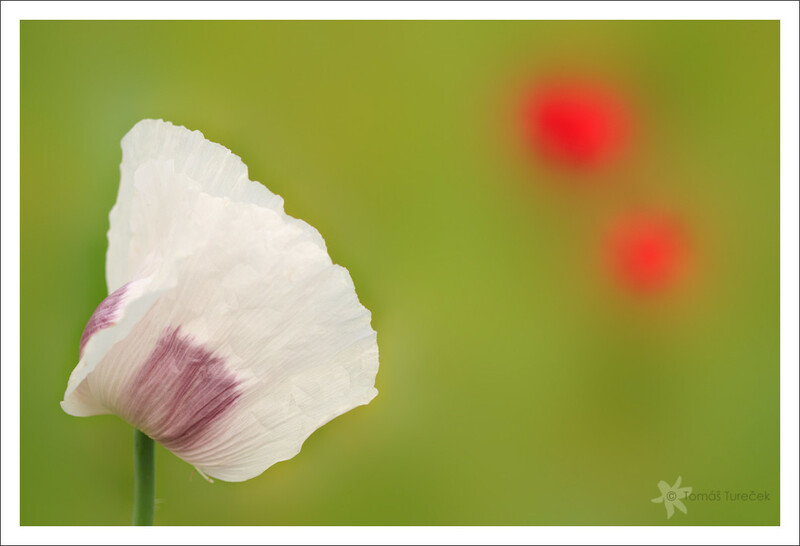 I noticed two large fields with blooming poppies when returning from shopping one day and so I prepared a camera and tripod and planned to take a drive to work next day. I stopped by a field with red poppies and noticed that it is a field of rapeseed accompanied by red poppies and camomile. The rapeseed had already seeds and was more than 1 meter high. If you ever tried to walk through rapeseed field in this stage of maturity you know that it’s almost impossible. The plants are so interwoven and holding so tightly that you really need to be strong to get through it. fortunately I didn’t need to do this fight as there was something like an entrance to the field created by a tractor so the rapeseed was pushed aside on several meters and this was more than enough for me to take some photos of this field beautifully lid by soft morning light. In such a cases when I am in front of a field of flowers I feel indecisive for a moment. It’s hard for me to decide where to start and how to start. I decided for straight centre macro/close-up first. You can’t spoil anything with such a photo, right? I wanted to have the petals blurred so I took a wide open shot (at f/2.8) but I also wanted to have all the stamens sharp. I had to combine 2 images for this, one at f/8 and one at f/14. Why I haven’t used only f/14? Because a slight wind was blowing that morning and the photo was a little bit blurry at f/14 so I used f/8 (sharp) for all stamens and f/14 only for those parts of f/8 shot where the stamens were not in focus fully. I was quite happy with the result but I wanted to make it more “creative” so I used (my favourite) Photoshop plugin Snap art by Alien Skin which simplified it nicely. You can see comparison image here. The upper half is original photo, lower half is with added “oil painting” effect. At first sight the difference is not big but I like the painted version a little bit more. 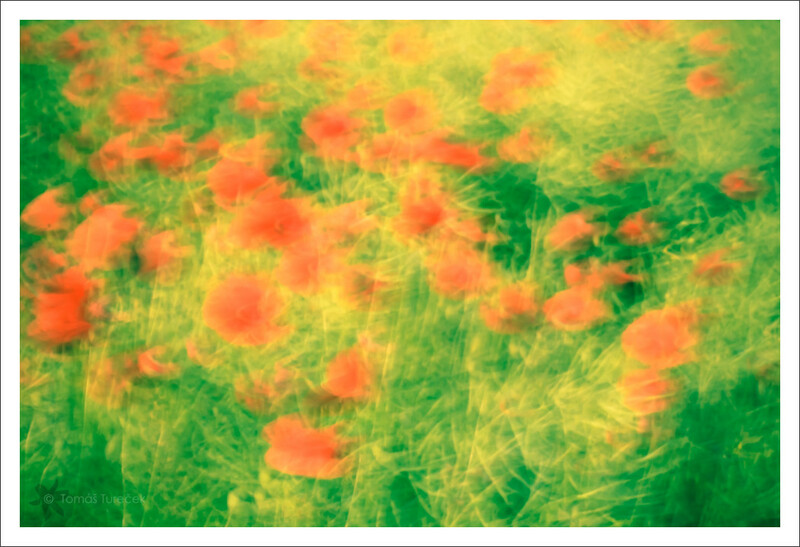 Another shot I wanted to have was a motion blur of poppy field so I tried and got one decent photo to work with. When I was playing with it during processing I came up with 2 versions but with totally different look and mood. I decided to post both of them and give them common title. The first version recalls my memories from the days when I was a small child. I was grown up in a village and so my early visual memories consists of warm sun, ripe fruits, field of golden crop, and garden flowers. Beside visual memories we usually have also smell memories and I remember warm and pleasant smell of hay, coll and wet smell of nearby woods and smoky smell of potatoes baked in ash. I didn’t mention poppies, wildflowers or rapeseed anywhere, still this photo reminds me childhood. Beside these comforting and pleasant memories we all have also bad memories. Mine are of bad dogs and first days with my first bike. When it comes to dreams, I have one dream which I remember very well – I am riding my bike and suddenly the road ends with a cliff and off the cliff I go and I faaaaaaaaaaaaaaaaaaaaaaaaaaaaall eternally. Second version of this photo is about bad dreams. Both photos were created using Lightroom’s 3 presets and their combinations. Last photo was taken on my way home from work. Close to the field where previous photos come from there was a field of white poppy basking in the evening sun. 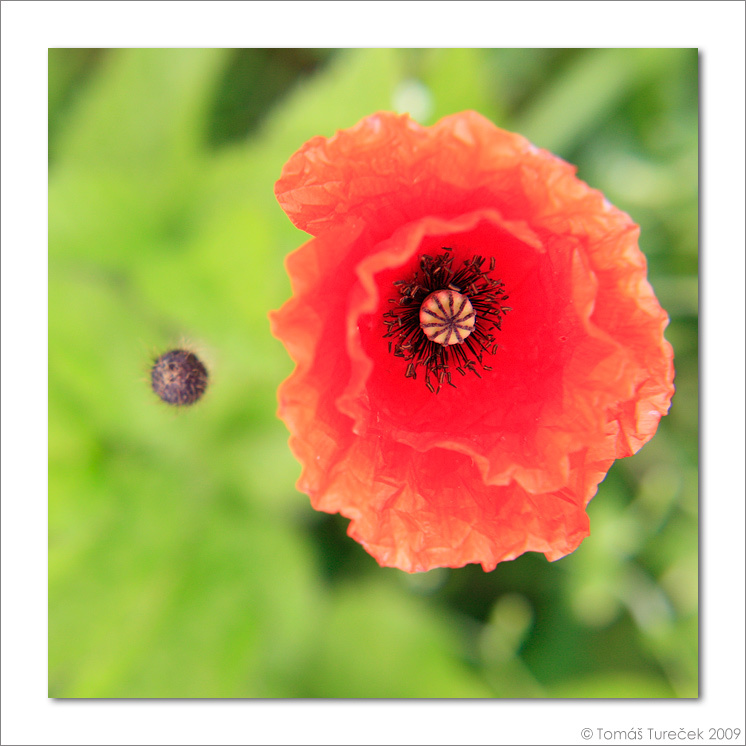 I was looking for some colour contrast and I found 2 red poppies on a border of the field. I thought it could work well together. The background was uneven so I had to use heavy Gaussian blur in photoshop and paint the poppies back then. I really would like to know if this photo works for you or not. I have more photos from this day but they are waiting to be processed, yet, and I’m not even sure if I will keep them all or discard some. I hope I’ll have something for next posts. Technical information: all photographs in this post were taken with Canon EOS 450D camera and Canon EF 100mm USM macro lens, in natural conditions. For the first and last photo a tripod was used. P.S. We had real summer today with 30° Celsius in the shadow, 50°+ on the sun and 27° inside house. 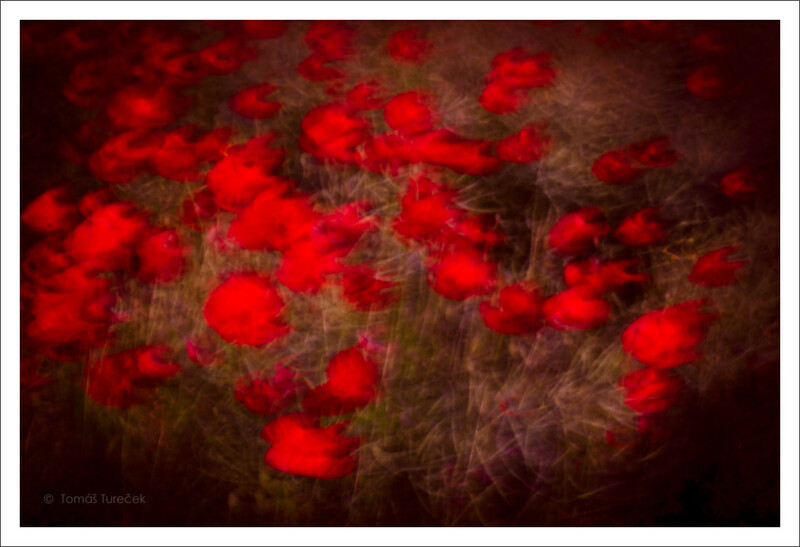 Well, to be honest, I thought the time of wild poppies is already over but then I was going back home from work this week and I was driving along a cornfield in our village, the corn seemed to be ready for harvest in a couple of weeks and suddenly I spotted some poppies blooming in the field. 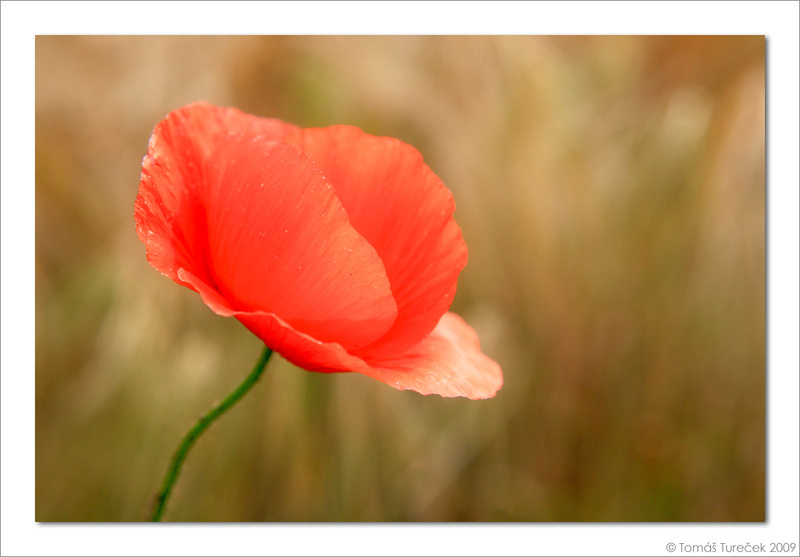 I wanted to take some poppies photos this year and I also did but not even one satisfied me fully. Now I saw this pretty bright red poppies in the gold/tan cornfield which I consider as a perfect combination, so I drove a little bit farther along the field and stopped where it was possible. 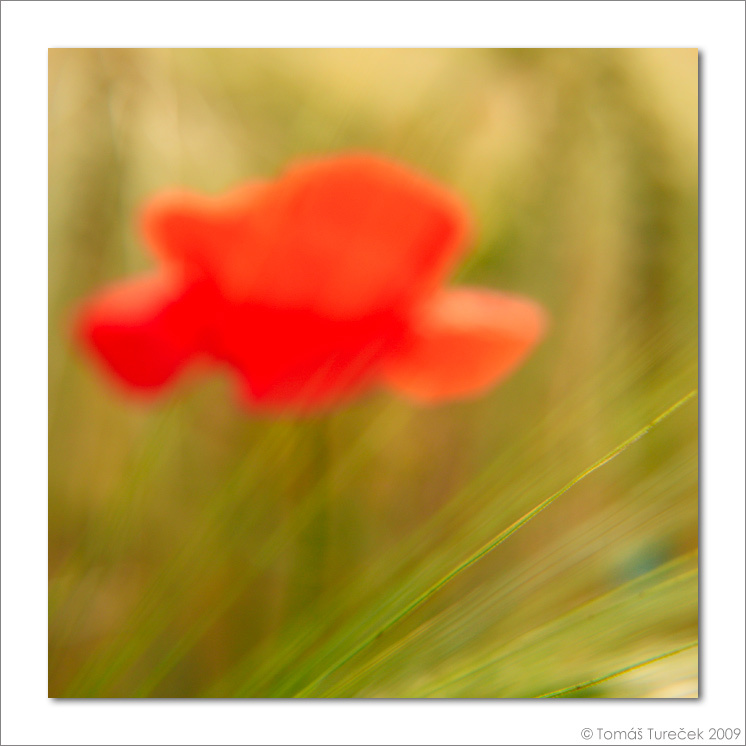 There was a number of poppies blooming just in the border of the field allowing me to take some photos of them with the field in the background or even with the grass around without a need to dive into the field itself. I took a number of photos and I chose following 3 to illustrate in which different ways you can capture one subject at one place. Always try to search unusual ways of seeing common things. All shots were taken with Canon EOS 450D + Tamron 17-50 f/2.8 + HOYA Close-up filter +4. PS: I have sold my spectacular Canon EF L 70-200 f/4 IS USM and purchased a Canon 100mm f/2.8 USM macro instead. The 70-200 is a superb lens but not for my purposes. I want to focus on floral/macro photography and this tele lens is not primerily good for it. I used a HOYA close-up filter but it has certain flaws such as strong chromatic aberration. I’ll share my first feelings about the macro lens as soon as I’ll get it.